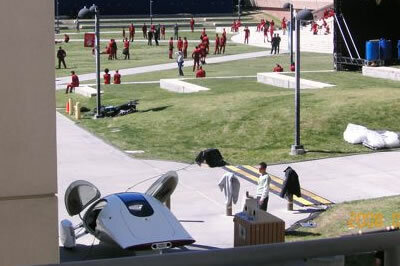 The Aptera electric vehicle is so futuristic-looking, it's been seen on the set of the new Star Trek movie. The new Star Trek will tell the story of the young James T. Kirk and his companions at Star Fleet Academy. Apparently, they will be tooling around the campus on the ghostly silent Aptera electric vehicle. The Aptera was designed from the ground up as an electric vehicle, and later as an extended range electric vehicle. After building the proof-of-concept Mk-0, we hired the automotive design firm, 'eleven', to help us further develop the concept vehicle. The 'eleven' team, led by Jason Hill and Nathan Armstrong, made great strides in the development of the Aptera's body styling, interior design, and structural engineering. [They] refined the Aptera's shape to maximize efficiency using CFD (Computational Fluid Dynamics), developed and built advanced suspension and drivetrain components, and integrated a strong yet lightweight composite shell. Another change that came in with a rush upon the discovery of a battery with insignificant weight, compact form, and great capacity, was the substitution of electricity for animal power for the movement of all vehicles. This, of necessity brought in good roads, the results obtainable on such being so much greater than on bad ones that a universal demand for them arose. This was in a sense cumulative, since the better the streets and roads became, the greater the inducement to have an electric carriage. Via Star Fleet Academy; thanks to Moira for the tip.